How often do you start the day at work exchanging stories with colleagues about, for example, why the bus was late, the film you saw last night, or who you met by chance on the way home? When we watch the news on television, presenters also often refer to the main news of the day as ‘our top stories’. Stories are central to our lives. As Jerome Bruner has said: “we represent our lives to ourselves (as well as others) in the form of narrative”. In other words, listening to, telling and sharing stories forms a fundamental part of our identity and how we are perceived by others. For this reason, Bruner also believes that it is vital to create a ‘narrative sensibility’ in children in their own language(s) through giving them access to and familiarity with conventional stories, myths, fables, histories, fairy tales and folk tales that are part of their own culture(s). It is these stories combined with the child’s evolving powers of comprehension, analysis, discussion and imagination that play an instrumental role in developing children’s sense of who they are. The value of stories in children’s first language development is backed up by extensive research. One classic example is the longitudinal study of children in Bristol described by Gordon Wells. This provides strong evidence to suggest that young children who are read to and told stories from a very young age have considerable advantages later on at school, not only in the development of literacy skills, which you might expect, but also in the development of social skills, such as empathising and being able to relate to others. Conversely, children who are not exposed to stories at an early age tend to do less well later, both in terms of literacy and in terms of integrating with others at school. It is arguable that stories can play a similar role in the context of children learning a second, additional or foreign language as well. From my own experience over many years of teaching, I am convinced that it can. In our classes with children, the magic of stories seems to lie in the way that they provide shared contexts for promoting participation and developing emerging language skills in a natural and spontaneous way. Stories also potentially engage children’s hearts and minds, as people and as thinkers, with issues that are relevant, real and important to them. The first is chosen with the approach of Halloween in mind! 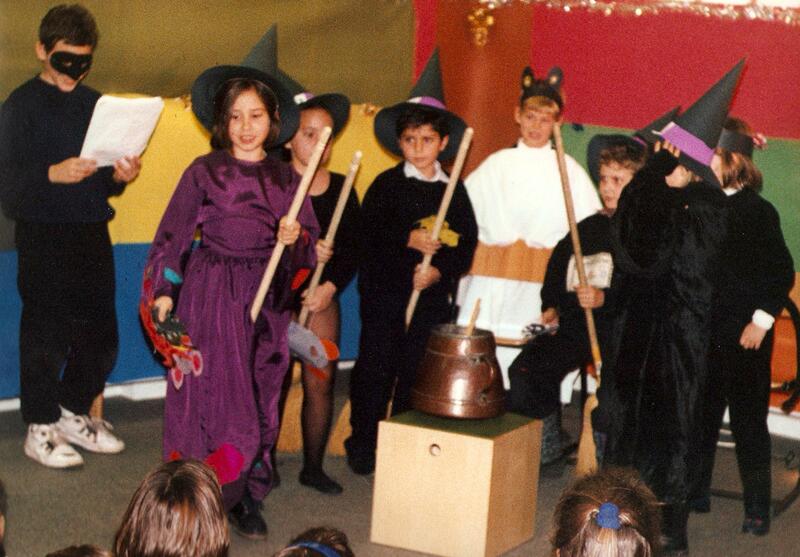 It comes from a time when I organised a drama week at the school where I was working to coincide with the end of the autumn term. The aim of the drama week was to provide a framework in which children from different classes could perform to each other. Teachers signed up and ‘performances’ were timetabled according to different ages and levels. Ground rules were kept to a minimum: contributions were to be short (no more than ten minutes); there could be dressing up and props but no-one was expected to do anything too elaborate. 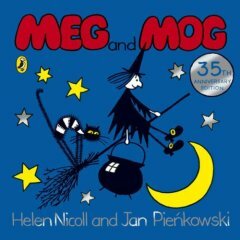 In preparation for the drama week, my own class (a group of 6-7 year old beginners) chose to dramatise the children’s picture book we had recently read for Halloween, Meg and Mog. The children had loved the story and were extremely enthusiastic at the prospect of putting on a play. The project included rehearsals, making masks and props, planning costumes, making programmes and invitations, and lasted over several weeks. Although the final production was modest (see photo above), the children felt a huge sense of achievement. There were a number of significant benefits in the longer term too, including increased confidence and motivation, greater class solidarity, improvement in the children’s willingness to use of English as a natural part of classroom communication, and greater involvement and positive support from their parents. However, the thing that amazed me most as a result of the experience of dramatizing Meg and Mog was the subsequent desire of the children to act out every story that we read together in class! This became something of a ritual with every storytelling session ending with cries of I want to be … / Can I be …? and an instantly improvised play. This is one example of the way in which stories, in this case combined with drama, engage and motivate children to develop language in a rich and naturally contextualised way. The second example is rather different and comes from a time when I was invited to a conference in a country that had recently emerged from a long and bitter war. The conference organizers asked me whether I would be willing to demonstrate storytelling techniques with a group of children in the main conference hall for teachers to come and observe. So it came about that I did a storytelling lesson with a group of 30 children, aged 9 -12, with 90 teachers observing – probably one of the most challenging conference sessions I have ever done in my life! I had never met the children before and did not speak a word of their language, although they had been learning English for at least one year, and some of them for longer. The story I chose to use with them was a big book version of Something Else, a wonderful story about difference and exclusion. At the start of the session, I was extremely aware of 90 pairs of teacherly eyes watching my every move (! ), but as the lesson got underway, I completely forgot their presence and focussed entirely on the children. The children’s response to the story was one of the most powerful and moving teaching moments I have ever experienced. Their ability to relate the story to their country’s recent experience of war and suffering was extraordinary. Their attempts to use every bit of English they had available to try to convey and communicate to me, as an outsider to their country, their amazingly mature views about how wrong it is for people to exclude, hate and fight each other, were impressive, and you could have heard a pin drop in the hall as they took turns to speak. As well as bringing home the power of stories in a way that I’ll never forget, this experience led me to think how we perhaps often underestimate the maturity of children’s thinking. It also made me reflect on how refreshingly open children are in discussing complex and difficult issues that, as adults, we often shy away from. I know that many people reading this will already be convinced of the value of stories. It would be wonderful to hear your views and share experiences of stories you have used. Notes: The above is based on posts I wrote as guest blogger on Storytelling on the British Council Teaching English website in February 2010. For examples, of story-based materials, see also the Magic Pencil and promoting diversity through children’s literature on the same site. For further reading on picture books, see Opal Dunn’s classic collection of Real Book News also on the same site, and visit Sandie Mourao’s blog. Thanks Carol far another interesting contribution. Something Else is really special and I love presenting it, too. Have you seen Forever Young in Time October 25 in Books page 56 on Lauren Child. by Carla Power? An interesting summary of Child’s contribution to the spread of picturebooks worldwide.. Her sales overseas are enormous – ref to Seoul Publisher- KOOKMINBOOKS. It would be interesting to know how many Overseas are sold in translation and how many in English……. Thanks so much for writing – and I’m very much hoping that people may follow the link in the post to read the collection of your Real Book Newsletters on the TE website too! You’re so right about Something Else. It is really special and hugely powerful in getting its message across. As I’m sure you know, it was also winner of a UNESCO prize. I first came across it when Gail Ellis invited me to write materials based on it for the new edition of ‘Tell it Again’ and it has been a favourite ever since. Lauren Child is also another of my favourites – Charlie and Lola are wonderful (and for anyone else reading this who’s interested, see Magic Pencil on TE site for materials based on one of her books, ‘I will not ever NEVER eat a tomato’). The DVDs are great too. I also like the Clarice Bean series for older children as bridging books in upper primary (although only suitable for quite high level and a bit too culture bound to use in a lot of contexts). There are also story materials for one of these in the Magic Pencil secondary materials. I haven’t seen the Time October 25 issue but will check it out as soon as I can. Yes, I also wonder about the ratio of original version to translations – I would imagine that the former must be on the increase. Anyone in Korea or elsewhere in Asia who knows about this? Thanks again for your contribution, Opal – great to see you here and wonderful that your passion for this topic never fades. It’s great reading, thanks for alerting us to it Opal. Hi Carol, two very nice stories about story-telling! I like a story by Somerset Maugham, I can’t remember the title, about a church warden a long time ago. When I tell it, if I told just the bare facts, it would take about a minute, but in the EAL/EFL class, with discussion and language work, it lasts ages! I don’t know of “Something Else”, but Opal seems to love it too. Thanks David. I’m glad you like the stories about story telling! I don’t know the story you mention but agree with you in general about the way a story can act as a springboard into extensive language and discussion work, especially with older children and higher levels. Do try and have a look at ‘Something Else’ when you’re next in a bookshop – interestingly on the Puffin website it says the book is suitable for children of 3-5 years even though the illustrations, theme and vocabulary are quite sophisticated. In an ELT context, I’ve usually used it with children in the 9-11 range and they’ve never felt it is ‘babyish’ – quite the opposite in fact. As a young learner teacher and trainer, I’ve long been convinced of the immense value of storytelling in aiding children’s English language development. Having been inspired particularly by the work of Gail Ellis and other colleagues at the British Council in Paris, I have used authentic children’s literature on YL English courses to supplement the coursebook and/or to provide child-friendly ‘points of entry’ into topics and themes on the syllabus. I believe that children’s storybooks are excellent vehicles for language as they embed it within a natural context which provides age-appropriate “comprehensible input” (in the Stephen Krashen sense of the term). In 2008, I crafted a range of 3 week summer intensive courses in Bangkok for primary-aged children organised purely according to a story-based syllabus. These courses had a dual objective i.e. to develop the children’s language in a holistic manner while also raising their awareness of diversity. I also love ‘Something Else’ which was one of the books we selected for the courses along with ‘Susan Laughs’, ‘Princess Smartypants’ and my all time favourite, ‘Giraffes Cant Dance’ with its superb messages around indivdiual difference and acceptance. Feedback on these courses from Thai parents / carers, the children and their teachers was excellent and this convinced me even more of the real usefulness of story-based courses. Colleagues who are particularly interested in linking storytelling and diversity awareness should definitely visit Carol’s blog on the Teaching English website as well as the diversity link she has provided here. I also posted on the Teaching English blog earlier this year regarding a project I developed to use stories with primary ELT learners. The aim was to raise their awareness of diverse sexual orientation and non-traditional family structures via storytelling. We used some superb storybooks including ‘And Tango Makes Three’, ‘King and King’ and ‘King and King Family’ which I’ve described in more detail in that posting. An especially memorable follow-up was also while I was teaching in Bangkok using the Eric Carle classic ‘The Very Hungry Caterpillar’ with Thai elementary 7 year olds. The children were able to personalise the content of the story and produce a beautiful wall display while having practice of the days of the week and quantifiers. They worked in groups to produce a food diary for a week in the life of a Thai Very Hungry Caterpillar! This included the following structures and lexis: “On Monday, he ate a watermelon. On Tuesday, he ate two mangosteens. On Wednesday, he ate three coconuts… On Saturday, he ate some sticky rice, some tom yum soup…” which they went on to illustrate using paper plates and we displayed it in the shape of the caterpillar’s body! The children really enjoyed the references to foods from their own context and gained useful pattern practice in a highly age and level appropriate manner. Great to see you here again and a huge thank-you for your wonderfully detailed and comprehensive contribution. I love all your detailed references to different story books as well as the way you recount your experiences in using them. I completely agree with the powerful reasons you put forward in relation to the value of using children’s literature in our primary ELT classes. In particular, I’d like to highlight the last one you mention that “stories often embed equality and diversity themes without being didactic or preachy”. This is so important as stories give us a way in to addressing vital personal and citizenship issues in a way that is non-judgmental, as well as indirect and non-threatening, since they are about characters and a context that are one remove away from the children themselves. Your contribution on my TE guest blog was really interesting in this respect and I recommend any other readers who are interested to pop over (link at the end of my post) and read what you said there. Thanks also for the lovely list of extension activities that you use with stories – a great source of inspirational ideas! I love the version of the Hungry Caterpillar that you got children in Bangkok to create too, with all those wonderful local examples of Asian fruit and other Thai food! Thanks very much also for the useful list of story telling techniques that you focus on in your sessions. You’re so right to highlight the importance of these and I completely agree that storytelling is an art which needs to be rehearsed and practised and which improves with experience and time. It’s always a good idea to practise reading or telling a story out loud, either on your own or to any willing listener, before you tell it to your class, thinking about where you’re going to pause, how you’re going to change and modulate your voice for each character etc.. I think also that we all need to work at finding our own personal style in the way we tell or read stories – some people are exuberant and dramatic, others much more softly spoken and low key – and both styles can be equally as effective in different ways. How very kind of you also to share this wonderful list of links to storytelling sites and resources – a veritable treasure trove, and great to have listed altogether here. Thanks again so much, David, for taking the trouble to write such a full and detailed contribution. I just hope that other visitors to the blog will also scroll down from the post to read the fascinating and invaluable things you have to say, and perhaps be inspired to add their own thoughts too. Carol your description of the session with Something Else is a treasure to read, thanks for sharing. We are so lucky to have the opportunity to read what you have experienced with the addition of all your wisdom Carol. Thank you so much for the time you put into the posts on your blog. Lots of great ideas and links, thank you and to David too 🙂 Places to discover and revisit. Ref Wright, A. (2003) The place of stories in ELT, in: A. Paran & E. Watts (Eds) Storytelling in ELT (Whitstable: IATEFL). Great to see you here – many thanks for dropping by! Thanks very much also for the second highly quotable quote from Andrew Wright – another gem! I’m so glad you liked the description of using ‘Something Else’ – it was a very powerful and unforgettable experience, so much so that, in fact, I thought twice about including it here. It was quite hard to write up in a neutral way and I very much appreciate your positive words. Many thanks also for your second message to Opal with the link to the article about Lauren Child – great to have direct access from here. Hope your internet access is behaving itself and you’ll continue to write lots more on your lovely blog (see end of this post or my blogroll for link for anyone else reading this). I am also a big fan of Lauren Child´s work and was really pleased to discover an extensive range of her storybooks (including the Clarice Bean and Charlie & Lola series) at the new Monument bookstore here in Rangoon. I recently relocated to Burma where I´m Young Learner Manager for the British Council. We´re launching story-based intensive courses for primary-aged children and one of the books we´ve selected is Lauren Child´s ´That Pesky Rat´ – the hilarious and highly compelling story of a street rat frantically searching for a decent home. With its themes of homeless and belonging, identity and discrimination, it is ideally suited to introducing children to some of the world’s pressing issues, which as I´m sure you´re aware, resonate deeply in the Burmese context. A common feature of children here is that they have no voice and no platform to express their difficult lives or grievances. The written word, sometimes even the spoken word, is a privilege beyond their reach. Some have never had a book read to them by an adult or read a book themselves. The idea of telling a story, even their own life story, is not part of their reality. This is why incorporating authentic children´s literature into English lessons has such powerful potential. Related to this, UNESCO, Lauren Child and Hachette Children’s Books are now in partnership to fundraise for deprived children which has led to the revamped and lengthened version of ´That Pesky Rat´ with both author royalties and publisher profits going to UNESCO. Another joint campaign by UNESCO and Lauren Child is entitled´My Life is A Story´ which gathers and publicises the unheeded and hidden life stories of children around the world. I plan to incorporate these into our storytelling lesson sequences by using books as a springboard and then moving to the life stories. Using picture books in primary ELT has convinced me of the value of what Carol calls ´distancing strategies´in her excellent article on Scaffolding Children´s Learning (CATS, 2008). This is where YLs can explore significant issues ´safely´ via the characters in the storybook. I believe that in a context like Burma, YLs can truly show empathy with others by bringing real, lived stories stories from children of a similar age into the ELT classroom while still remaining ´at one remove´. If they feel comfortable and appropriate rapport / trust has been established, they may then want to articulate their own life stories. The characters in That Pesky Rat provide great, light-hearted points of entry into the significant themes / issues I mentioned earlier and then towards the end of the book, it includes photos of children and stories (about their challenges and successes) from Russia, Mexico, Afganistan and India. There is also a superb web link with lots more photos of children and their stories. We could use it as an ICT link in class activity sequences (e.g. as a web quest) or it could incorporated into an extensive reading project. I´d love to hear from any colleagues who use these superb materials with their young learners and what the outcomes were. Thank you so much for your interesting and rich message and for sharing this wonderful Lauren Child / UNESCO / Pesky Rat website which I hadn’t seen till now and am delighted to discover. It’s fascinating to hear about your experience so far in Burma. The intensive story-based courses that you are planning to set up for the young learners you teach sound a hugely worthwhile, if challenging, project. I agree with you entirely that the characterization and story of The Pesky Rat offer children a safe distance from which to explore relevant issues that may touch on sensitive areas. The fact that the new UNESCO edition of the book now also has children’s own real life stories and photos will also potentially provide a wonderful bridge into personalizing the content and getting children to talk and write about their own lives. I wonder though how the children’s lack of familiarity with being read stories in their own home and school context may influence their response. It will be extremely interesting to hear about your experience of using these materials and some of the outcomes. Please do continue to share and it would be lovely if you would like to encourage some of your teachers who will also be using the materials to do the same. Lauren Child – as I’m sure I’ve mentioned somewhere previously – is also one of my very favourite children’s authors and it’s great to hear that her books have travelled as far as Rangoon. Interesting too from a cultural point of view as there are many aspects of particularly Clarice Bean, but also Charlie and Lola, that seem very culturally specific to the west but, from what you say, this clearly doesn’t stop their universal appeal about relationships between families and siblings getting through. Many thanks again for your great contribution – it’s really enjoyable to continue discussing aspects of story telling here, and it would also be lovely to hear responses from Opal, Sandie and others on this too. but I was too shy to approach you and to say how much your enthusiasm and good advice means to me as a young teacher. I do my best to make my lessons enjoyable and assure that kids actually learn. I focused on very young learners (3-7 ) and I need all the materials I can find. I surf the net endlessly in search of stories (accompanied with pictures and worksheets /or just ideas to use). I found plenty ideas and I ‘ve used my own creative methods but I can’t always find suitable pictures to go with the story. Can you please suggest me some? sorry for writing this on your blog, maybe I should have written on your mail , but it seems that there is a problem with it ( as I get it back as a failure message). Following the success of our story-based courses on our intensive primary programme in March, we’ve decided to integrate a story-based curriculum into our regular courses from July. Children attend classes here at British Council Burma for 3 x 2-hours per week and we intend to use a coursebook for one lesson and storybooks for the other 2 lessons. We’ll have a series of lessons based around two storybooks every 10-week term. Initially, we’re adapting the superb lesson / activity plans for 8 children’s books (colleagues can download these from the Teaching English website by clicking on the ‘Promoting Diversity through Children’s Literature’ link) developed by colleagues at the British Council Paris Teaching Centre by making the follow-ups specific to the Burmese context. Then, we plan to develop 10 lesson plans for a further 3 stories which include the fabulously contemporary ‘It’s a Book’ by Lane Smith (Roaring Brook Press, 2010, see: http://www.lanesmithbooks.com). This story asks: Can it Text / Blog / Scroll / Wi-fi / Tweet? No … it’s a book! and was brilliantly read by Sandie Mourao at the IATEFL Brighton Conference earlier this year. It is a light-hearted story about how technology has invaded children’s lives, but makes a key point that books still are special in their own right. For me, this story is an excellent example of a more ’emedded’ approach to the promotion of particular diversity aspects. We’re balancing this with 2 storybooks which feature more explicit diversity themes in age-appropriate and manageable ways. The first of these is a non-fiction picture book about acceptance: ‘My Princess Boy’ by Cheryl Kilodavis (Aladdin, 2009). The little boy in the story loves the colour pink and sparkly things. Sometimes he wears dresses and sometimes he wears jeans. Inspired by her son and by her own struggles, this is one mother’s story about unconditional love and friendship. The second is ‘My Henry’ by the bestselling children’s author Judith Kerr (HarperCollins, 2011), with its magical illustrations and rhyming verse she shows how she copes with the death of her husband in ways that primary children can understand. She writes, “My Henry died and went to heaven, But now he’s got his wings They let him out from four till seven, And we do all sorts of things…” Both of stories offer English teachers powerful vehicles to enable younger learners to explore challenging themes / significant issues. I’d love to hear from teachers who have used stories of this type to develop their learners’ language skills and diversity awareness in non-threatening and engaging ways. Great to hear from you and many thanks for this detailed update on the courses you are running for children at the BC in Burma. Sounds a wonderful mix, both the story books you are using and the way that you are integrating a story-based curriculum into your regular courses. Lucky children – and can imagine your teachers will very much enjoy all the opportunities for creativity, personalization and engaging the children in interesting, relevant issues when working in this way too. Sounds very sensible to be making use of the BC Paris diversity materials and producing context specific follow up materials based on these. Some lovely stories and materials there, so why look further! Yes, I know ‘It’s a book’ and was also there for Sandie’s excellent rendition at the Picture Book symposium in Brighton. A lovely contemporary theme, as you say. Thanks also for writing about the two other storybooks you are using, neither of which I know (although I am very familiar with a lot of Judith Kerr’s other work), so really good to hear about these and will put them on my list of picturebooks to find out more about. It would be extremely interesting to hear if any of your teachers feel inspired to share their experiences of using these story books with Burmese children. I particularly wonder if there are any cultural clashes in using picturebooks which are essentially fairly UK-centric, both in content and illustration style, the kind of characters portrayed etc? As you say, it would also be great to hear from anyone else who has experience of developing language and diversity awareness in non-threatening and engaging ways. Many thanks again for writing and hope the July courses go really well!